Several dozen people have sent me media reports on this trial over the last few days. The headlines from publications all over Australia seem to be blaming the victim and excusing the alleged perpetrator. As much as I want to – which is a LOT – I can’t risk a fix on this yet. But I do want to talk about why I haven’t done the fix and what I am hoping to do about it after the trial is over. All these articles are court reporters writing about what happened on the first day of the trial. They were reporting the defence’s opening statement and, in some cases, part of the prosecutors opening statement. It’s very difficult to tell from the media reports what actually happened in court that day. Maybe most of the day was taken up with procedural matters that either can’t be reported or aren’t useful information for the public. Maybe the defence opening statement took up most of the day and the prosecutor didn’t have time to say much. Court reporters, particularly in a murder trial, need to be very careful about what they say when they’re reporting the proceedings. They cannot give any opinions on what they saw or heard in court, they cannot change the evidence presented to the court because they don’t like or agree with the way it was presented. It’s the ultimate “just the facts ma’am” reporting. Having said that, there is no reason they can’t provide context. If the only evidence given that day was from the defence, journalists should say that. If prosecution will be making their opening statement the next day, journalists should say that. If defence is attempting to create sympathy for the accused by blaming the victim, journalists cannot make that call on their own, but they can report any rebuttal by the prosecutors. Which is where we come back to the real problem here. Despite multiple reports on the trial, we still don’t know what happened in court that day. And we should. The trial is in Sydney, I am in Melbourne, so I can’t get there to find out for myself. Without transcripts or reliable reporting from someone who was in the room I won’t risk a fix to the headlines about a trial that is still going on. Mistrials are rare, but they have happened. A murder trial was aborted in 2016 when a journalist included previously published information in an article about the trial, unaware that the judge had issued a suppression order on that information. It would be easy to give in to instinctive anger at the headlines and reporting from the first day of Warren Rogers’s trial for the murder of Anne Rogers. However, the fix I want to do on this is not worth the risk. From the time someone is arrested until the moment the court finishes with the charges (which includes the appeal period) any crime is considered to be sub judice, or before the court. Anyone who publishes something that could be considered prejudicial to a fair trial is committing sub judice contempt and it could be grounds for a mistrial. If I put out a fix claiming Roger’s is guilty when the court has not yet determined his guilt or innocence, it could be considered prejudicial, particularly if it gets a high-volume turnover on social media and defence was able to make a reasonable argument that the fix was or could have been seen by a member of the jury. 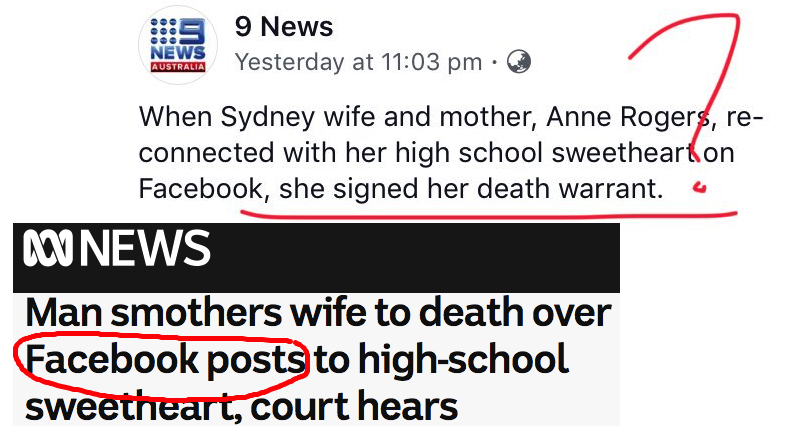 In practice this almost never happens in Australia and maybe I’m being overly cautious – certainly not a problem the rest of the media is suffering from in their reporting of this case. Regardless, I am not going to risk it. I’ve talked to people who worked on the murder trial that was aborted after Yahoo’s screw up and it was utterly devastating for the family of the murdered woman who had already waited far too long for justice. No matter how important the point I want to make, I can’t risk doing that to another family. That said, things change after the trial is over. A copy of the transcript, some help with the research (thank you Chrys Stevenson) and the time to do a detailed comparison of what was said in court against what was reported about the trial might give us all some insight into why this terrible reporting occurred and how (or if) it could have been done better.